Back in January, I wrote an article on the scapegoating of video games in the aftermath of the recent shooting tragedies in the United States. I focused mostly on defending the medium, pointing out the lack of evidence and logic that the other side had, and presented some data showing that games did not have the harmful effects that news media and politicians were claiming. During that part of the year, members of the games industry came out and made their arguments, refuted the claims on news outlets and talk shows, and met with members of congress and the White House. Even though there were plenty of people coming out in defense of the industry and it’s products, the entire set of events left me feeling uneasy and frustrated. Games survived this round, but I know that the instant that we are faced with another tragedy in this country the mindless finger-pointing will start again. There’s a whole range of issues and subjects to consider in that debate, but I’ll leave that discussion for another day. Today, I want to give some attention to a project that is looking to change how games are presented to the rest of society. 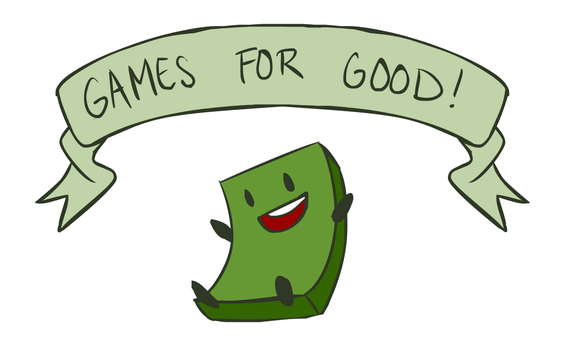 James Portnow, probably best known as the writer of the web show Extra Credits, has started a RocketHub for a project titled Games for Good to help promote the positive effects that games have on our society. If funded, it will allow him to dedicate a full year to meet with law makers, work with game creators, and work with grant organizations to help fund games that have a positive impact. The idea is that rather than only coming to the defense games whenever they get blamed for issues, we should be promoting the positive elements regardless of whether they are being attacked or not. This is essentially a more proactive approach to the issue. From what he describes in the pitch video and in a recent episode of Extra Credits, many of the politicians in Washington are only familiar with video games in terms of action and First Person Shooter stereotypes. Games have been suffering from a lack of positive representation and a lack of understanding by people who do not have a lot of experience with games. Part of this will involve James Portnow lobbying in the Washington area, but he’s also looking to help make it easier for positive game projects to get the funding they need. Hence the talks with grant organizations and the game developers that could use the money. From what I’ve observed at his appearances at PAX and MAGFest, Portnow is a great spokesman for games as an art form. At last year’s MAGFest he and Dan Floyd spent 4 hours answering questions from people about working in the industry, about game creation, and the industry’s future. It was a very informative and interesting experience that left me very impressed with their knowledge and expertise in the field. If this project were to take off, I have no doubt that Portnow would do well as an ambassador for these games that are creating a positive change and for the industry in general. I think this is an important project that games as a medium need. It’s great that we have groups that already go out to defend games when they come under attack, but I agree with Portnow that more needs to be done. The narrative needs to stop being about us explaining why games aren’t “murder simulators” and more about what they do for us as a society. This project can help show others, especially our law makers, the merits of games and help developers find the means to create more of these positive experiences. Please take time to check out the RocketHub and the Extra Credits episode discussing the project. You’ll find much more information about what I’ve summarized on this post. Perhaps just as important, I would encourage you spread the word about this project. I haven’t seen to many people mentioning this RocketHub on gaming sites or forums. The project is siting at 80% funding at the time of writing. I really hope this gets funded. This type of discussion about games is something that I think really needs to happen.